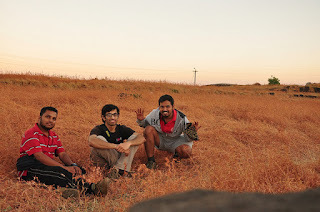 This was the most unplanned trek ever, yet again, to Rajgad fort. The start was a routine- Train to Pune (Indryani express), travelling to Swargate ST stand (PMPML) and long wait for the Gunjavane direct ST bus (which eventually never turns-up, making us take a ST bus to Nasrapur bypass). A breakfast and tea gets pushed into the long-wait. 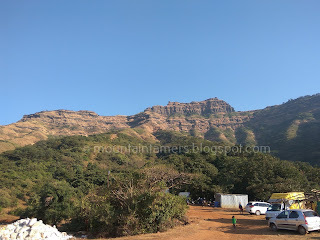 The bus to Gunjavane, which was scheduled at 11.15 AM shows up surprisingly at 11.45 AM but for Velhe destination, that is the village at base of Torna fort. So we boarded the Velhe bound bus and got down at Gunjavane bypass. मेरा देश बदल रहा है, आगे बढ रहा है: The ST bus (आमची येश.टी.) well known by the name- लाल डब्बा, had a local server hosting top quality HD Marathi and Hindi Movies, which was rather pleasantly surprising for all of us. We readily took-out our (not so) Smart phones and took the full benefit of the journey. We also enjoyed educating some (interested) locals around us, how to access the server etc. We got down at Gunjavane bypass and opted for an auto to Gunjavane village, avoiding an hour of walking (about 6 km) in the afternoon heat. गुंजवणे गावात मस्त मिसळ-पाव आणि ब्रेड-ऑम्लेट खाऊन, आम्ही झोपायच्या गड चढायच्या तयारिला लागलो. 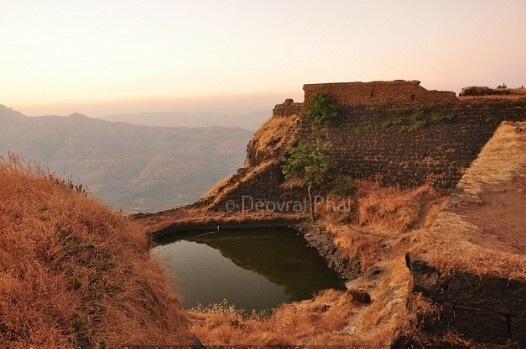 From Gunjavane village, there are two trails reaching Rajgad fort. One follows the secret entrance to Padmavati Machi via Chor Darwaza and another trail is via Gunjavane Darwaza. 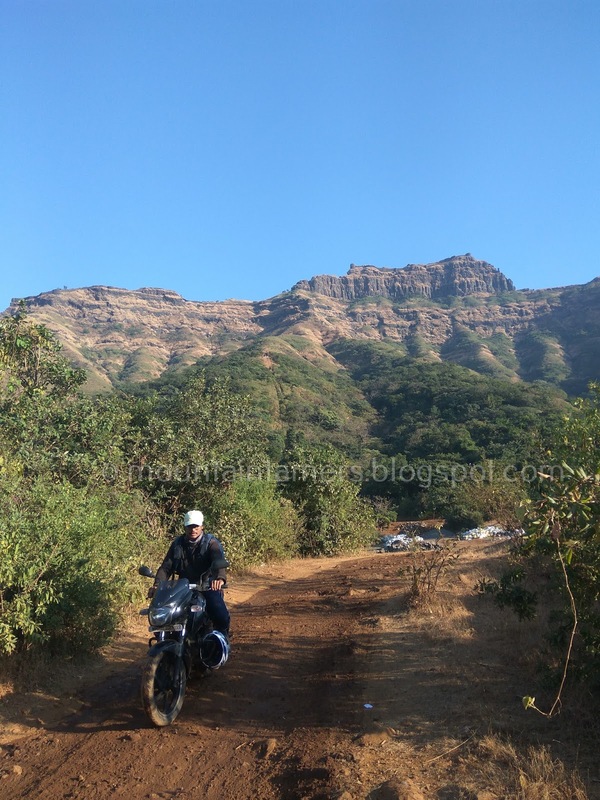 Gunjavane Darwaza route is not very common, is less crowded and considered tough by many websites. The picnic-public usually take the Chor-Darwaza route. Now, we made an on-the-spot decision. 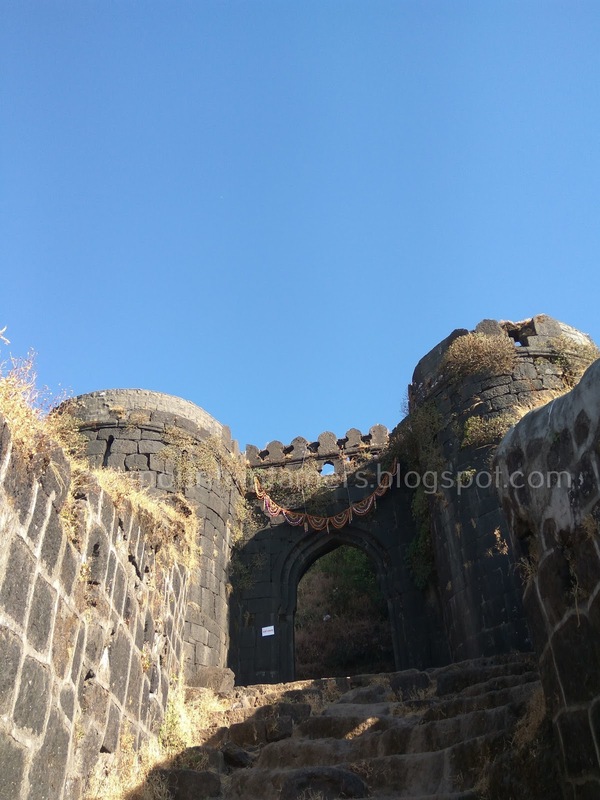 We decided to take the Gunjavane Darwaza trail to the fort, as opposed to the usual Chor Darwaza trail, to avoid all the boisterous crowd. 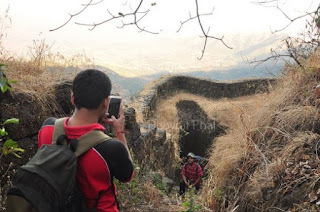 As you know, we are NOT a commercial money-monger group, but on the contrary, we make our own decisions, we plan our own treks, with experience, class and attitude, without causing any harm to nature !! Gunjavane Darwaza trail (गुंजवणे दरवाज़ा): We followed the directions given by काका from the shop- Start the usual trail, enter the gate and follow till the house of a villager. You will find that initially, the trail enters forest. You might also sense the trail descending a bit. We walked along a fence to our left-hand-side and crossed a semi-dry water stream. That gave us a rough direction of the lake- the artificial check Dam known as Pazar Talav. First checkpoint is the Pazar Talav. Every inch of the lake was dry (it was December). The place was well covered by trees and the first information board could be seen lurking out from the bushes. That is exactly where the trail starts. We entered the forest again, and the tree-cover was thick from this point. Route started climbing gradually. We enjoyed every bit of the trail as the the tree-cover helped us overcome the heat. The tree cover continues till the fort becomes visible near the first clearing. We encountered Mango, Jamun, Teak (साग), Karvi (Strobilanthes callosus) etc trees along the way. As we approach the top, karvi trees started dominating their presence along the slope. The scree also starts about the same time and iron-railings makes it easy safe for negotiating the scree. The route becomes slippery due to the scree (during Summer) and water (during Monsoon). 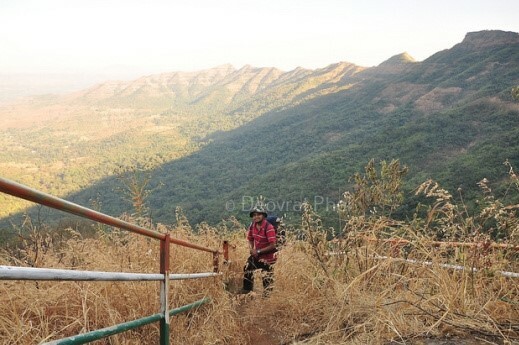 You can also expect the trail to disappear during monsoon due to thick flora. 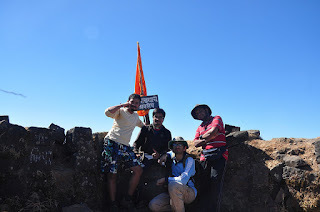 We crossed the Rajgad-Pradakshina trail along the way. The climb started getting steeper as we entered the first (broken) Darwaza through the remnants of old broken steps. By the time we entered the first Maha Darwaza, the Sun was blocked by the Suvela Machi. Yet again, we had the Sun to our advantage. We could see the silhouettes of trekkers climbing down along the Suvela Machi. 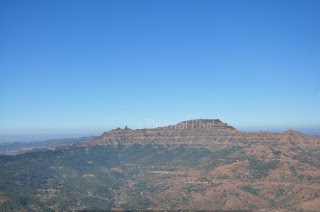 We could also see the natural needle formation in the mountain- the नेढ. 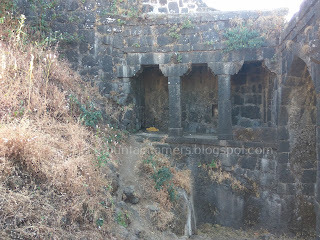 Gunjavane door is constructed in Gaumukhi style architecture (गोमुखी द्वार रचना) of Maratha's, with porch built-in. The structures surrounding the door were constructed with interlocking mechanism, without the use of any adhesives. The typical curved stone-construction surrounding the door was marvelous as usual. The stone steps leading to top of the door, the water-way, and the intricate carvings on the door were mesmerizing and gives us the flash-back of the construction back-then. In all, we crossed a series of three doors to enter the fort at 16.30 hrs. It is not known as which, out of the three doors, is the Gunjavane door (as of 2016). 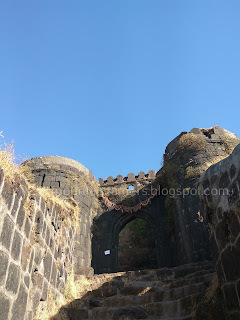 As we entered the fort, we could experience a lot of activity happening. A lot of tents surrounding the Padmavati temple. The group was responsible for the annual Rajgad-Pradikshana. We found an empty spot and pitched our 4-men tent, just behind the temple. For now, we were just three- Aaditya Gurav, Ninad Vilankar and me. The fourth guy- Nikhil Phatak, was on his way, and this following paragraph is his story to reach Rajgad!! The Nikhil's entry via Pali Darwaza: Nikhil was sick the other day and he had forfeited his plans to join us. But as we reached Nasrapur bypass, he called us and decided to come on his Bike. He asked us to wait for him at the top, the place near Padmavati Machi, where the trail enters the fort from Pali village. It was already dark and were waiting eagerly for any signs of his existence. We didn't receive any text, any ping nor calls from him. We spent our evening observing the cars, their flashlights and the tiny houses near Bhosalewadi (भोसलेवाडी). The (less known) legendary historian, Sahyadri explorer and a nature lover- Appa Parab, blessed us with his presence on the Rajgad fort. काही व्यक्तिमत्त्वे स्वतःसाठी जगत नाहीत, इतिहासासाठी जगतात, अप्पा परब हे त्यापैकीच एक. As we watched the darkness creeping along the fort walls, there appeared Nikhil Phatak, emerging from the darkness with his torch and a happy face. 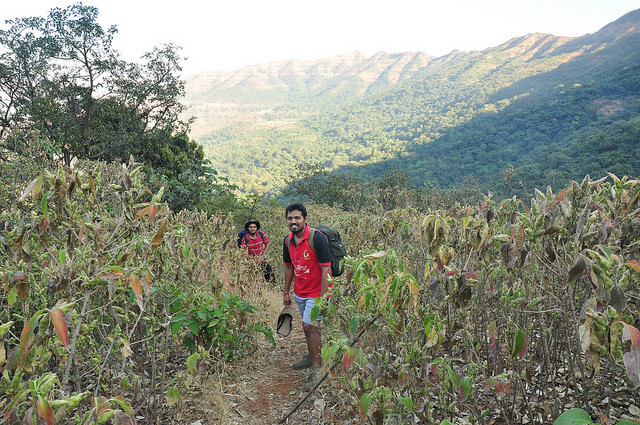 He braved his illness and came to Rajgad no matter what. It was a pleasant and most awaited reunion then. No words can possibly describe that reunion. 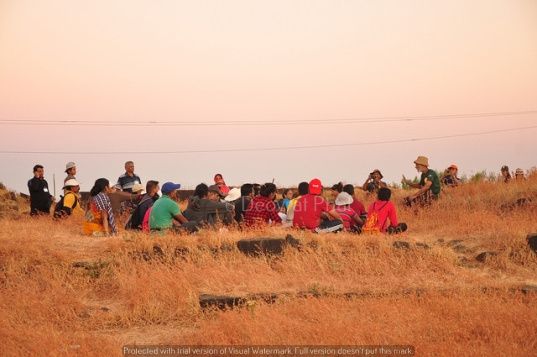 Night-life and Star-gazing: The picnic crowd was overflowing the the top. We went to an semi-isolated place to see the stars. Ninad was passionately describing each and every details about the galaxies, constellations, planets, meteors etc. The M-constellation, great dipper and way to determine the North star (Polaris), the Dog star, Taurus, Deer-Table-Bow-Arrow combination (Orion or the hunter), the Milky way, the bright star in sky is Venus (शुक्र), Mars (मंगळ) comes out and goes before dawn, Planets dont flickr, Stars do etc. 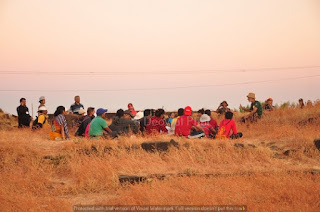 and lots of useful information that is beyond the scope of this article :) The time passed by until the great dipper (सप्तर्षी) came out, which meant, it was very late and we need to be asleep (the picnickers were still shouting their lungs out). Fort Exploration: Fort of Rajgad was constructed on the mountain named Murumbadev (मुरुम्ब देवाचा डोंगर). The routes to Citadel or Bale killa, Suvela Machi, Sanjeevani Machi, Padmavati Machi are well marked. The fort is undergoing a lots of restoration (which is good) and some places could be seen with piled-up concrete bags and construction equipment. Bee-hives could be spotted en-route Sanjeevani Machi. Padmavati Machi (पद्मावती मची): The secret route from Gunjavane village enters this plateau via Chor-Darwaza. 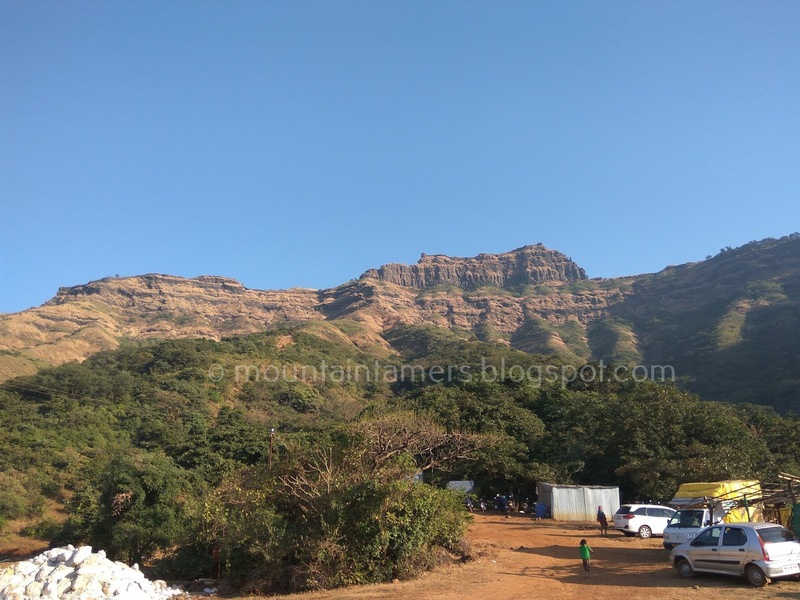 This plateau houses a Padmavati lake, Rameshvar temple (Shivling and idol of Lord Hanuman), Padmavati temple, Tomb of Queen Sai-bai (wife of Ch. 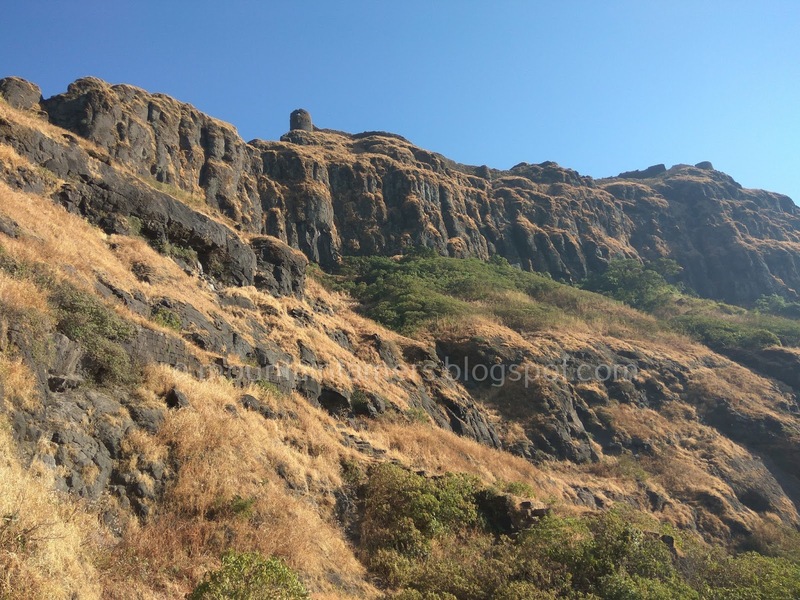 Shivaji Maharaj) and many remnants of the Raajwada (राजवाडा). The arch-entrance to Padmavati lake is still standing till this date. It is NOT PERMITTED to swim in the lake. Padmavati temple is also surrounded with handful of water cisterns. Padmavati temple can accommodate about 30 people inside. Other attractions were Amberkhana, another squarish Lake, Pali Darwaza (read further for more information), Storage for arms and ammunition. Baale Killa (बाले किल्ला): The Sunrise from the top is always memorable. The route till the top is narrow and exposed at few places but fitted with iron-chains and railings. It is advisable to the picnic-crowds from commercial picnic companies to not shout and make your (super-pleasant) presence known to the nature. It becomes difficult to differentiate between monkeys and such people. Also, it scares the monkeys and other trekkers who visit forts in the quest for peace. 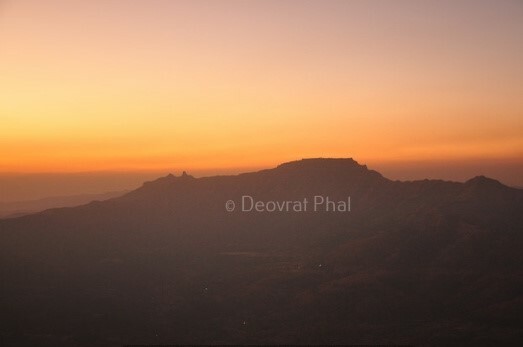 The citadel is the highest point of Rajgad fort. The main entrance of the Citadel was uplifted recently. (The route was even more tough when I was here in 2004 - there were no railings, no chains. This was good back then because it kept away the picnic crowd). The door and its fortifications were given a face-lift, trying to restore the forgotten glory. The famous Chandrakor lake (चन्द्रकोर तळे) meaning, a lake that resembles the crescent of the Moon, lies further ahead of the entrance, after climbing the series of stairs. The water from this lake is meant for drinking (and it is advised to picnic crowd, not to put your beautiful feet in it). Top has two temples- Goddess Janini Mata (जननी मातेचे मंदिर) and Bramharshi (ब्रम्हर्षी). The name Janini Mata sounded weird because both words, Janini and Mata as the same meaning i.e. Mother. There is a mid-sized cave en-route the Citadel which can be used for pitching a tent. Camping on the top is usually avoided due to strong winds. 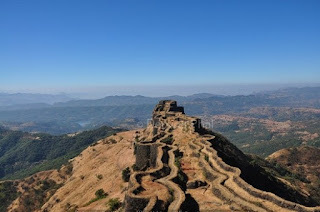 Sanjeevani Machi (संजीवनी माची): The double-fold fortification runs along this 2.5 km long plateau. Several secret entrances are built which allows us to come out of the main fortifications. The three-phase construction has a bastions at each end. 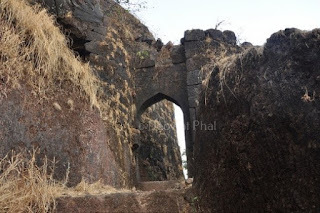 The famous Aal Darwaza (आळ दरवाजा) can be used to exit Rajgad towards Torna fort along the ridge. The door has collapsed to a great extent (as of 2016). The ridge can be clearly seen from the end of Sanjeevani Machi. We could see Bhutonde (भूतोंडे) village and edge of Bhatghar dam-backwater. We could also spot some Pradakshina people and the villagers helping them with carrying foodstuff. Note: The name is Aal (आळ दरवाजा) and not Alu (अळू दरवाजा) as everyone calls it. This was clarified to us by the historian Appa Parab (when we went back to the Padmavati temple). Sanjeevani Machi has series of water tanks, but the potability of that water could not be judged. We spotted some collapsed construction and some short shrubs covering them. The stone blocks can be seen here. 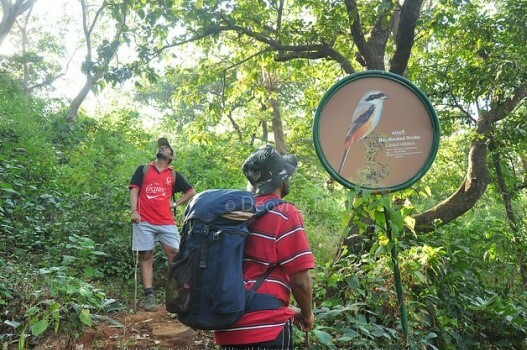 For calm and interested trekkers, there is a narrow short-cut route to Suvela machi directly from Sanjeevani Machi. I do not recommend it for new trekkers and picnic crowd. Suvela Machi (सुवेळा मची): This is yet another three-fold construction along the eastern side of the fort, starting with Duba hill. Compared to Sanjeevani Machi, this Suvela Machi has more tree-cover. Kaleshwar buruj, Nedha, Hasti Prastar are some well known locations on this Machi. Nedha (नेढ) is a naturally formed hole through the mountain. Nedha can be seen on other mountains/forts like Nakhind, Madangad, Gorakshanath (in Manmad region) etc. 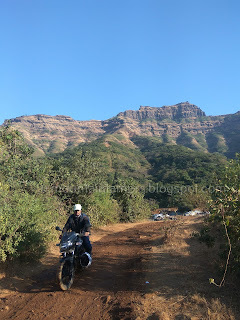 Descend via Pali Darwaza: Ninad and me, we decided to descend via Gunjavane darwaza route and Nikhil-Aaditya via Pali Darwaza route (Nikhil had his bike parked in Bhosalewadi and Aadity decided to join him and explore bit of Pali route). The trail to the Pali Darwaza is the easiest and offers the view of Torna fort throughout the trail. The route is also termed as Raajmarg (राजमार्ग ). It is big enough for an full-grown elephant to enter through this route (easily). Some door construction has fallen apart restricting the ability to view the top of the door. During Monsoon season, the approach road to Bhosalewadi is not recommended for private vehicles as it gets mud-lodged (as of 2016). 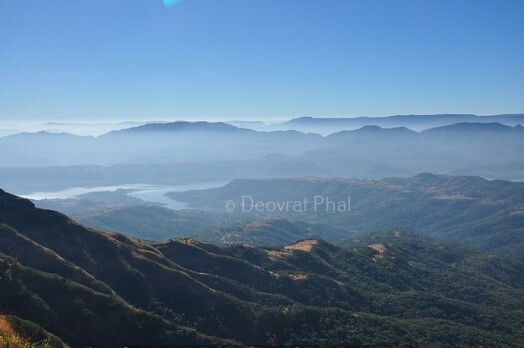 Also, there is no public transport available from Bhosalewadi or Pali village. Ending note: From Swargate, if there is no direct bus to Gunjavane village, then bus to Velhe village or any bus going via Nasrapur bypass is good. From Nasrapur bypass mini vans and jeeps ply to-from Gunjavane village. For return journey, if you do not find any transport from Gunjavane village, then walk 6 km to Gunjavane bpass and try your luck. There's more chance to get a ride. Last bus from Gunjavane to Swargate is at 4.00 PM (as of 2016. Timings might change. Ask at the base village before starting the trek). The water from Padmavati lake, Chandrakor lake is meant for drinking hence don't pollute it. During peak summers, the whole village at the base depends on those lakes. The cosmosgod - Deovrat phal. Simple theme. Theme images by rion819. Powered by Blogger.